A Layne & Bowler 3-stage vertical pump is used to wash out bulk railcars before loading them with polyethylene and polypropylene at a resin plant in La Porte, Texas, U.S.A.. The process fluid is water and washing debris. Process temperature is ambient. Run-dry events occur frequently with this pump when debris blocks the suction inlet or when water in the sump falls below the minimum suction level. 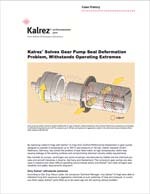 Such events were causing failure of the pump’s line-shaft bearings three or four times a year. The solution: Installation of DuPont™ Vespel® CR-6100 parts as line-shaft bearings. 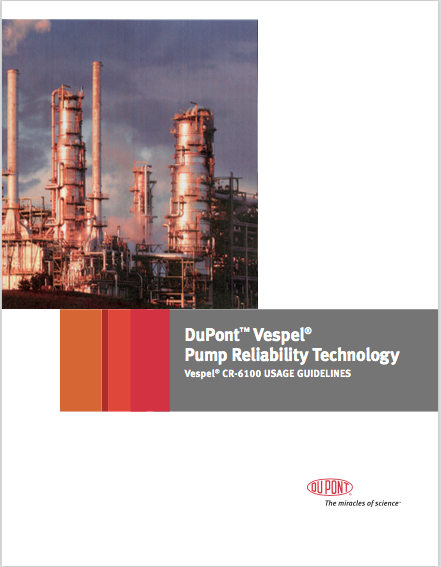 Survival of run-dry events: One month after the installation of Vespel® CR-6100 bearings, the pump ran dry for somewhere between 1.5 and 3 hours, according to plant personnel. Once suction conditions were restored, the pump was restarted and exhibited no damage. Long-term reliabilty: The pump has been running without failure since October 2003. DuPont™ Vespel® CR-6100 was selected for the line-shaft bearings because of its anti-seizing properties and ability to survive run-dry events. An advanced composite material consisting of DuPont™ Teflon® PFA fluoropolymer resin and oriented carbon fibers, Vespel® CR-6100 has a low coefficient of friction, low wear rate, high PV capability, and a coefficient of thermal expansion 70% lower than that of carbon steel. This unique combination of properties allows Vespel® CR-6100 to survive where previous materials have either seized or worn out.